On advantage of this grotty weather is we get some fantastic cloud-scapes and rainbows, this complete double rainbow lit up North Haven on Tuesday night. We are up to thirteen Seal pups now, all of which are in the caves or inaccessible bays around the Neck. Lots of adults and heavily pregnant cows hauling out on North Haven though. They sing and moan all through the night, which would make for quite an eerie experience if you didn't know what they were! 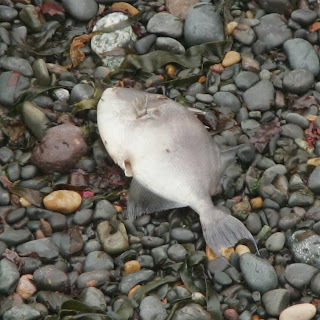 An interesting sighting of a Grey Triggerfish (Balistes capriscus) washed up on Matthews Wick on Monday. This fish lodges itself into nooks and crannies using a clever trigger-like adaptation of it's dorsel fin to hold itself in. Most things (including us!) are keeping their heads down in these strong winds, but a few more waders trickling through and another Balearic Shearwater seen in St Brides Bay. Two Sunfush were seen from the boat today, one of which was nearly 6ft across! There was also lots of Porpoise around today and yesterday. The island is looking a little ragged around the edges after the last few gales, and another forecast for tonight. The salt laden winds do a grand job of beating down and salt-burning the Bracken, but unfortunately do the same to the veggie plants in the garden. There have been a few pleasant days with nice sunny spells between the showers and with some waders and warblers to be seen. Turnstone and Common Sandpiper on North Haven and Rye Rocks, Whimbrel, Curlew and Ringed Plover passing through and lots of Sedge Warblers and Whitethroats. First Snipe passing over on the 24th. One Reed Warbler on the 24th. The first Song Thrush yesterday and the numbers of Robins are building up - these birds don't breed on Skomer but do pass through and overwinter here. Fresh Barn Owl pellets found at Moorey Mere hide - one of their favourite roosts. We suspect that a pair has bred this year around the cliffs. One Sandwich Tern heard passing over North Haven on the evening of the 23rd. One incident today of a private boat coming in very close to a pupping beach and scaring several pregnant cows into the water. This highlights the need for good education and awareness of the disturbance that people can cause. Please have a look at www.pembrokeshiremarinecode.org.uk and follow the guidelines to ensure you don't disturb Seals or Seabirds. Pete, our Visitor Services Officer (glamorous title for a chalet host!) left Skomer today. He has been here for the last five months and has done a grand job looking after our overnight guests and generally helping run the island. Have a look at www.welshwildlife.org/OvernightaccommodationSkomer_en.link for more info about coming to stay on Skomer. There are lots of young Shearwaters coming out of their burrows each night now, they are easily distunguished by their slightly overweight appearance and the tell-tale tufts of grey, fluffy down that they still sport here and there. There have been fewer adults coming back in the last few nights, it is likley that some of them have started on their migration to the waters off South America where they will spend the winter. Now is a great time to do a bit of Seal watching on Skomer and around the Marloes penninsula, the adults are hauling out each low tide in North Haven and around the Garland Stone. The bulls will start taking up territory around the pupping beaches and there will be plenty of interactions to watch. Make sure you follow these rules if you go out seal watching, and go to http://www.pembrokeshiremarinecode.org.uk/ for more info. > Seal pups sleep a LOT! It is normal for them to lie still for hours, their mothers will come ahsore every few hours to feed them. The mother may not come ashore if there are humans around so don't stay too long. The Shearwaters are starting to fledge, they come out of their burrows to exercise their wings each night and get an idea of the big-wide world, they have been underground since hatching for about 70 days! These youngsters can be told apart from the adults by a few tufts of fluff here and there. Late August or September is a brilliant time of year to come and stay on Skomer and see the young Shearwaters. Amazingly these youngsters will find their way to the wintering grounds off the coast of South America all by themselves - a wonder of bird migration! Big groups of diving Gannets and feeding Porpoises have been seen in the last couple of days. Also one Balearic Searwater in St Brides Bay. Oystercatcher roosts are building up and a few other waders are present such as Whimbrel and Common Sandpiper. The Kittiwakes have now all fledged and abandoned the ledges, but there are still young Fulmar to be seen. can be watched playing in the up-drafts from the cliffs - fantastic flyers! We think that their numbers build up at this time of year as they come to take advantage of the fledging Shearwaters. Two Wildlife Trust staff are polishing their walking boots for some serious hiking to raise money for Skomer and the Welsh Wildlife Centre. Llinos Richards, who used to work on Skokholm Island and now manages the Welsh Wildlife Centre, and Lucy Griffiths who manages Lockley Lodge, our mainland shop and information centre at the boat departure point, are getting ready to start a mammoth charity trek........they are looking for your support to keep them going through those many, many miles..! The Walk on the Wild Side is a charity trek covering the entire 186 miles of the Pembrokeshire Coast Path in 12 days this September to raise vital funds for the Wildlife Trust of South and West Wales. We’re hoping to raise over £2000 for the Trust and would really appreciate your support. We’re both passionate about conservation education and are keen to help the Trust improve the facilities it provides for schools and other visitors to its reserves. Thousands of children and adults visit our reserves each year both for pleasure and for educational purposes and in order to safeguard local wildlife for the future it is vital that we get our conservation message across to our visitors in an engaging and impactful way. The funds raised by the Walk on the Wild Side will go directly towards the development of facilities and material for educating future generations of conservationists, specifically those on our reserves at Skomer Island and the Teifi Marshes. Social activities also increased in the last week, despite being on an island you actually end up having less time to yourself than when your on the mainland because it is so sociable! My colleagues, volunteers and some of the 'repeat offending' overnight guests have made my stay on Skomer so enjoyable-there is always a friendly face around. This week we had more volunteers over than normal, as a group from the Pembrokeshire mainland reserves came over with an awful lot of wood to create a new boardwalk at Moorey Mere and to replace the boardwalk over South Stream. They did an amazing job, and seemed to have finished it before I'd even realised they'd started! Although it did take the whole day before to bring the planks over in the islands boat then carry them bit by bit up the track with the tractor. Dave didn't know whether he was coming or going after going back and forth so many times! -especially interesting to watch in the evening after dark when the adults come in to feed the chicks. My last day on the island was perfect, a gorgeous sunny day where we spotted 8 common dolphins off the coast. Carl and Kenny were even luckier on the Dale Princess round island cruise to see 3 Risso's dolphins-quite a rare sighting. The day was completed by a night of absorbing the sights and sounds of the Manx Shearwater whilst watching shooting stars in the recent Perseid meteor shower. Skomer is definitely an island paradise. I'd like to thank everyone who's made my time on Skomer so special, and wish everyone Happy island viewing! A potato in the hand; not as good as thousands of shearwaters on the sea. As promised in my last post, the weather has been both hot and sunny the last few days. Fantastic times for being on Skomer. Swimming in the sea at lunchtime is becoming a more regular occurrence, though maybe swimming is still to strong a word for what amounts to jumping in, screaming and thrashing about before quickly climbing back out. But we jump in again, and surely that's the point. One of our success stories this year has been our vegetable garden. Resurrected after several untended years with a new and improved fence after a rabbit attack, it has begun to reap a terrific harvest: potatoes, beans, beetroot, carrots, peas, courgettes (millions of courgettes), radishes and a whole variety of lettuce. As well as being a relaxing way to spend the evening it has a more valuable role; we don't have to do as much shopping. I'm sure you can appreciate that bringing fresh vegetables back to the island is a problem - they are easily crushed and they soon go off, and potatoes are heavy. So a big thank you to everyone who has helped on that throughout the year, in particular volunteers Julian and Myf. Well the life of a warden isn't all swimming and potatoes; we have deal with our fair share of awkward customers as anyone. Yesterday it was a couple from a motorboat who wanted to land on the island, a National Nature Reserve full of ground-nesting birds remember, with their dog. When it was pointed out that that wasn't allowed they explained that they only wanted to let their dog onto the beach so it could do it's business. As if that was fair enough and not completely disgusting. The day was rounded off with an excellent evening round-island cruise on the Dale Princess. Myself and Haf joined a group of visitors to offer our 'in-depth' knowledge about the island, talking about the history and pointing out any bird life. We ended up north of Skomer and found a raft of thousands of Manx Shearwaters, a truly spectacular sight as they swarmed past us. These birds were waiting to return to their burrows by the cloak of night. Trouble is the skies are clear and there's a really bright full moon out at the moment. Looks like those young shearwaters will just have to wait a while. Assistant Warden for Skokholm and Skomer. The weather won't stop the science. We're into August already! With only a month left on my contract I'm looking at making the most of the island, unfortunately the weather seems to have other ideas. Our day trip out to Skokholm yesterday was cancelled as big southerly winds made landing there utterly impossible. A disappointment for those who'd booked their place on it months ago, and a disappointment for myself as I want to see it before I head off; not only have I got to count the young fulmars, I've left a load of clothes and food over there. Skokholm jetty with large southerly swell - no chance of landing here. The good news is, for anyone travelling down to Pembrokeshire this week, the forecast is a good one for the rest of the week and next weekend. Perfect for picnics on the island while looking out to sea spotting dolphins, porpoise and gannets. Although the breeding season is coming to a close on Skomer that doesn't signal the end of scientific work. 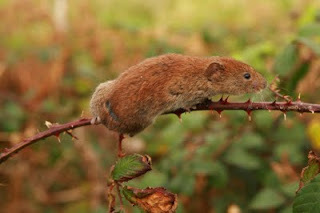 Staff and volunteers are getting a chance to help with research on the unique race of Skomer Voles that live on the island. The Manx Shearwaters are still feeding their young and our researchers have been up most of the night, when they return to their burrows with food, fitting them with all sorts of tiny hi-tech gadgets so we can find out all about where they go during the day. The more we understand about the shearwaters' feeding habits the better equiped we are to protect them as a species. When they have time we will hopefully have a blog entry from the researchers, explaining their work and what they've learnt. Skokholm and Skomer Assistant Warden.